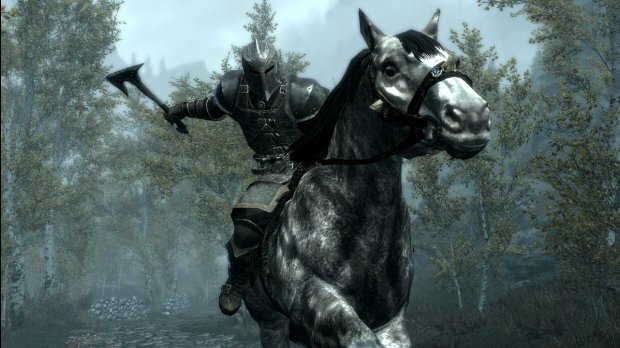 Besides the following fixes below, the official update for Skyrim allows you to attack while on a horse! 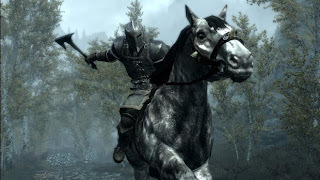 With Skyrim receiving it's first expansion with Dawnguard soon, now is a good time to get back into the game! - General stability and memory optimizations. - General AI pathfinding optimizations and bug fixes. - Optimizations and crash fixes for data leaks. - Fixed rare crash with lighting. - Fixed crashes related to loading and saving games. - Fixed crash with summoned creatures/NPCs. - Fixed rare issue where saves would be corrupted. - Improved logic for when ranged kill cams are played. - Fixed issue with ranged kill cams while killing a dragon. - Fixed rare issue with certain ranged kill cams not playing properly. - Fixed issue with nirnroot lighting not properly cleaning up. - Fixed issue where bow damage was being calculated incorrectly. - Fixed rare problem with werewolf kill moves would not finish animating properly. - In "The Break of Dawn" fixed rare issue where Meridia's Beacon would disappear from player's inventory. - Fixed occasional issue where followers would disappear after player pays off a bounty after committing a crime. - Fixed issue where certain creatures and NPCs would fail to respawn properly. - Fixed rare issue with dialogue subtitles not displaying properly. - Fixed issue with water appearing blurry when loading a saved game after creating a save underwater. - Fixed issue where map cursor would occasionally disappear after closing a message box with Kinect enabled (Xbox 360). - Fixed rare issue with shouts only performing the first level and not other unlocked levels with Kinect enabled (Xbox 360). - Fixed issue where the shout buttons would stop working properly if users mashed LB and RB during cooldown with Kinect enabled (Xbox 360).